Open home security - your Arduino burglar alarm: Connecting balanced PIR sensor. 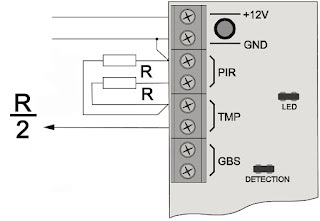 Picture on right side shows how to connect balanced PIR sensor. The idea is beautifully simple, I'm not the author I have got inspired by professional alarm boards. 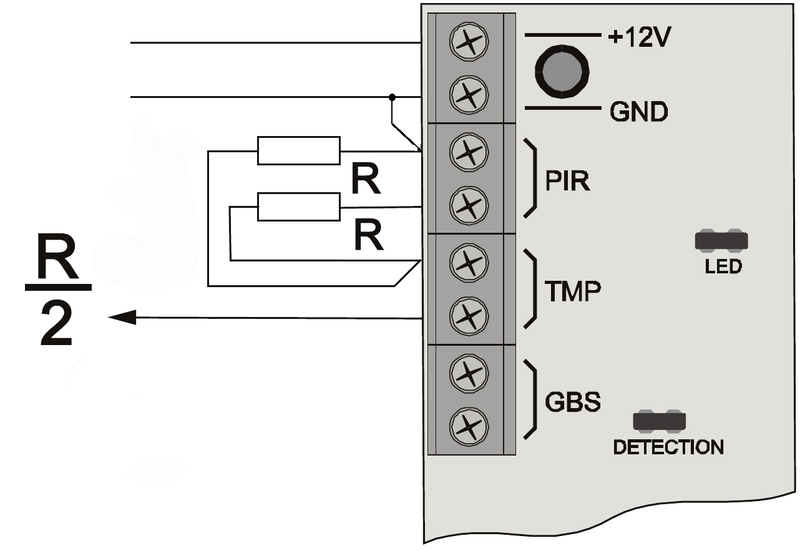 It is required to add two resistors into the end of every PIR sensor loop, and create simple voltage divider. Any analogue input on gateway is prepared to handle such divider. Resistor values are set in software and expected value is 2k2 Ohm for both. As you see from diagram there only 3 wires needed to connect a PIR to gateway input as ground is common to both. There is possibility to daisy chain the sensors in one loop, but then you need 4 wires and the resistor divider will be present only on last sensor in chain. With such setup the gateway is then able to recognise 3 different states of any sensor. That is OK, PIR and Tamper. And it is very hard to tamper the wires connected to sensor as attacker is not able to measure the resistance hidden inside the sensor.